'Saving Fish From Drowning': A New Direction for Tan In her new novel, Amy Tan sets a group of tourists off to Burma accompanied, in spirit, by a friend and guide named Bibi Chen — who mysteriously dies before the start of the trip. While Chen mirrors other characters of Tan's previous novels, Saving Fish From Drowning marks a departure from Tan's stories of close-knit Chinese-American families. Lynn Neary talked with Tan about her new direction. In her new novel, Amy Tan sets a group of tourists off to Burma accompanied, in spirit, by a friend and guide named Bibi Chen — who mysteriously dies before the start of the trip. While Chen mirrors other characters of Tan's previous novels, Saving Fish From Drowning marks a departure from Tan's stories of close-knit Chinese-American families. Lynn Neary talked with Tan about her new direction. With her first novel, "The Joy Luck Club," writer Amy Tan began to develop a loyal following of readers fascinated by her exploration of familial relationships steeped in the culture and folklore of China. But in her latest novel, "Saving Fish from Drowning," Tan leaves that territory behind, both literally and figuratively, as she tells the tale of a group of American tourists lost in Burma. NPR's Lynn Neary reports. Amy Tan says with every book, she has to come to terms with a new set of fears. After the huge success of "The Joy Luck Club," she worried that her second book would be a dismal failure; it wasn't. All of Tan's novels have been well-received, so this time she worried because "Saving Fish from Drowning" is so unlike her other books. 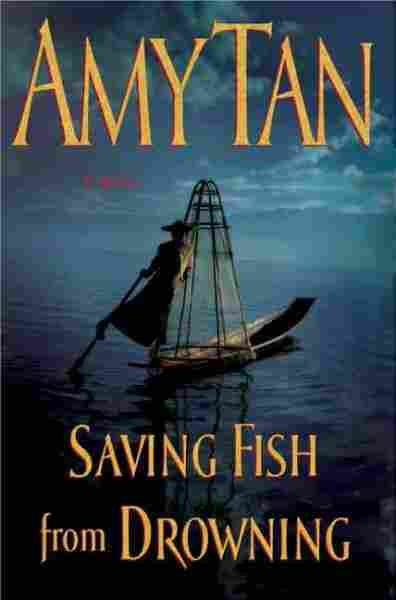 Ms. AMY TAN (Author, "Saving Fish from Drowning"): I knew that I was going to be doing something different from all the books, that it wasn't going to concern mothers and daughters or sisters, and it just scared me. I was also going to do something for the first time that wasn't so deeply personal and intimate, that had more to do with politics, in a way. So there were a lot of unknowns with this book for me. NEARY: Tan was also scared because during the writing of this novel, she was diagnosed with Lyme disease. The illness triggered seizures, memory loss and a devastating lack of energy. Ms. TAN: It was hard to concentrate, and when you can't stay focused from sentence to sentence and paragraph to paragraph, it is hard to write a novel. So I was in great despair over that. I couldn't read even two pages and remember what I had read. NEARY: Another big change in Tan's life is that her mother--who has figured so prominently in her writing--died after a long struggle with Alzheimer's. Tan says she doesn't know yet whether or not whether she has fully explored her complicated, often difficult relationship with her mother. This new book is not about that kind of relationship, but Tan says her mother is still a part of it. Ms. TAN: Bibi Chen, the character, the narrator of this book, is very much like my mother. If my mother had been educated in all those areas, if she spoke English a bit more fluently, then I think that much of the way Bibi talks about things--her observations, her honesty, her inappropriate remarks--are something that felt very natural to me, because I used in mind my mother's voice. NEARY: The most important thing to know about the character of Bibi Chen is that she is a ghost. She dies unexpectedly and violently just weeks before she's supposed to lead a group of her friends on an art tour of China and Burma. The group goes ahead with the trip led by a guide who knows little about China and even less about Burma. The spirit of Bibi Chen watches everything and though she can't really intervene in what happens, she can comment on it. It is Bibi who describes the subtle changes that occur as the tour bus enters Burma, now known as Myanmar. NEARY: These tourists know little about the land they're entering. Their ignorance and naivety eventually lead them deep into the jungles of Burma, which is now ruled by a military dictatorship. Ms. TAN: It's a beautiful country. What you see on the surface is what these tourists see. But there is something that is hidden and invisible beneath the surface and high in the jungles, and that's where I wanted to take people. NEARY: Tan takes people to that final destination with a story that is filled with broad characters, absurd situations and a couple of red herrings. In a note to the reader at the beginning of the book, Tan claims to have discovered the story of Bibi Chen and 11 American tourists who went missing in Burma in the Archives of the American Society for Psychical Research. Tan also includes a supposed news clipping about the missing tourists. All of this is presented as if it were true, but it is not. Tan says she thought the story was so obviously farcical that no one would ever believe it. Ms. TAN: Instead, I had friends saying, you know, `It's amazing that you actually knew this person, Bibi Chen.' And I said, `Do you remember that story of the woman who died mysteriously and her body was found in the storefront window in Union Square?' And they said, `Yes,' and this astounded me. NEARY: One reader fooled by Tan's introduction was Sharon Barrett, who reviewed the book for the Chicago Sun-Times. When Barrett sat down to begin her review, she found herself writing that Tan's introduction purports to tell the reader about the real events that led to the book. Ms. SHARON BARRETT (Chicago Sun-Times): And the fact that that word had come out in my own writing made me then go back and think, `Well, you know, maybe it isn't.' And then I started looking at that beginning much more closely. NEARY: Barrett realized that Tan used a clever twist on the literary device which she refers to as `the manuscript in the attic ploy,' where a narrator finds a real document on which the story is supposedly based. Barrett believes Tan is playing on her readers' desire to suspend their disbelief. Ms. BARRETT: We want to believe that this world we have entered through the portals of another imagination indeed exists, that the narrator is or has been among us. And I think that's her motive for setting this up, that she really wants us to believe that even if the narrator is a ghost that she did exist. NEARY: Tan says she was willing to use whatever device worked in order to get readers involved in a story that also deals with the often brutal politics and human rights violations of Myanmar's military regime. Ms. TAN: I was always keeping in mind that I needed to lure the reader, in the way fiction can be seductive and subversive, to a place most of us don't want to go. So my charge was a very simple one: Get people hooked into a story with whatever genre worked--romantic comedy, adventure, murder-mystery, the whole shebang--and get them to this very dark place and simply get people to remember the country Burma, that it's now called Myanmar, that there are people who are suffering and dying. NEARY: For Amy Tan, "Saving Fish from Drowning" is about larger issues and emotions. Ultimately, Tan says, she wants both her characters and her readers to discover their own capacity for compassion for people who are all but forgotten by the outside world. Lynn Neary, NPR News, Washington.